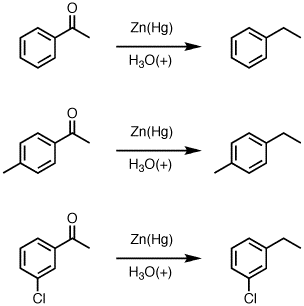 Description: Addition of zinc amalgam, Zn(Hg) and acid to a ketone results in an alkane. This is called the Clemmensen reduction. On an Orgo 2 HW question we had to propose the synthesis of 1-bromo-3-propylbenzene. This was a multiple choice question, so we had to figure out the order of using the clemmensen reduction, bromination of arenes, and friedel crafts. What kept throwing me off was what order to put them in. It’s tricky! Could you explain how to approach that? Thanks so much for your help, this is a great site and is extremely useful! My org chem professor told me that clemmensen reduction of 1,3 dicarbonyl compounds gives a differently rearranged compound. Like 3,3-dimethyl-1,5-cyclohexanedione, gives 1,3,3-trimethyl-cyclopentanone (less membered ring). And 2,4-pentanedione gives 2-methyl-3-butanone. Could you explain to me the mechanism of these reactions and suggest ways to write the product for any such dicarbonyl clemmensen reduction? I honestly have no idea. I’m still in high school so I have no idea about the Dowd-Beckwith expansion reaction, however the Wikipedia page did throw some light on it. However I think that shouldn’t be happening, since we aren’t using a alkyl halide side chain or AlBN. I still haven’t fully understood it though. Also, in my previous comment I seem to have gotten the IUPAC names wrong. It should have been 5,5-dimethyl-1,3-cyclohexanedione, 2,4,4-trimethyl cyclopentanone and 3-methyl-2-butanone.